Whenever there is volatility in the market, all sorts of analysts, portfolio managers and economists will line-up one after the other with all sorts of buy recommendations. They will tell you to buy real-estate; they will tell you to buy US stocks; they will tell you to buy Bonds; some will even tell you to buy Bitcoin or other crypto-currency. But what about silver? Is it a good investment? Perhaps one of the reasons it isn’t really talked about that much in financial media has to do with silver trading at about a 7 year low. It’s down about 65% from its 2011 peak at $50USD, currently trading in the $USD14 and $USD15 dollar range. Aside from a brief uptick to $20USD in the second quarter of 2016, silver prices have remained depressed. That said, the supply-demand dynamics in silver appear to suggest that the asset is oversold. Here are five charts to look at before investing in silver. 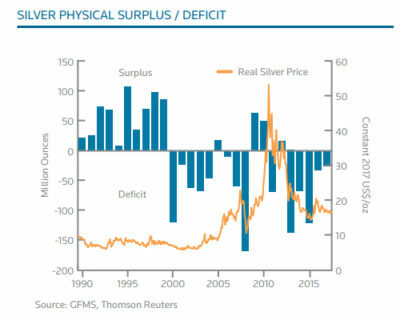 The chart below illustrates the silver mint surplus or deficits. In the 1990s the price of silver was very low as there was an abundant supply. However, that changed in 2000. Since the turn of the millennium, there are more years in deficit than in surplus. This means there is more demand for silver globally than what the mines can produce. Where does the demand from silver come from? It mostly comes from industrial applications making silver a little bit different from gold. Silver is heavily used in industrial products. That is why the demand for silver decreased in 2009. But things might be changing with photo-voltaic demand in the solar electricity generation sector increasing. Of course, there is always jewelry and silverware – that is also something to keep an eye on. On the investment side, people prefer buying and holding silver coins and bars because investors would rather own physical silver in their portfolio as a hedge against inflation. 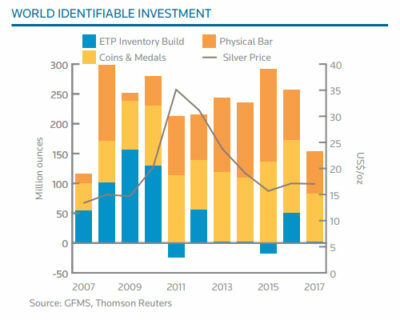 Taking a closer look at the investment side of silver, one thing to note is that the demand for coins and bars dropped most in 2009 during the financial crisis. A couple of reasons this could have happened; investors rushing to liquidity, or, selling their silver assets for US dollars. Don’t forget, during the last financial crisis, the dollar was cheap, and commodities were considered expensive. 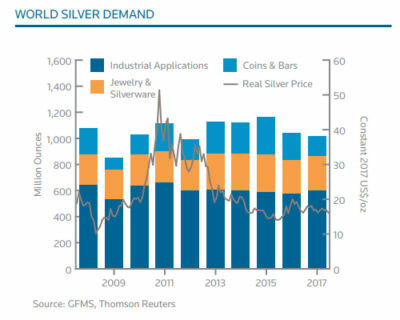 On the flip side, the highest demand for silver coins and bars was in 2015 when there was plenty of liquidity and silver prices were cheap – and it still is. Now, if you are considering an investment in silver the chart below is the one you really have to look at. The Total Cash costs and capital expenditures for mining an ounce of silver stands around $11USD. While there is a little room for further price declines in silver, there is not much risk to the downside for silver prices. I would put the bottom of silver prices at $14USD, which we saw in 2015 (and where the price is currently is trading at. This makes silver a low-risk investment, unlike gold where there is more space for it to go down so silver is really interesting. Another interesting player in the silver market are exchange-traded products and their inventory build. Since silver prices hit their all-time high, there hasn’t been much interest for Exchange Traded Products and their inventory started to taper off. Most of the demand comes from selling coins and physical bars to private investors. But when things turn, whether that is a result of speculation or worries about inflation, and Exchange Traded Products see higher demand, this will likely increase the price of silver. The biggest ETP holdings are iShares Silver of course, then there are some ETF securities from ZKB, Julius Baer Group, and others. That said, this is a good thing for silver. There is no speculation in silver prices. In the words of Benjamin Graham, you have to invest where Wall Street isn’t looking now, but at some point in time, they will look at it again, which makes silver, especially at these prices very interesting. Now lets we compare silver to gold. 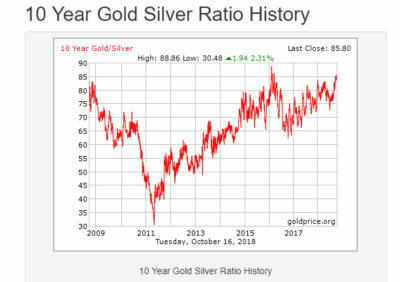 The gold to silver ratio recently hit a 10-year high. You have to put 83 ounces of silver to get an ounce of gold. Historically, whenever this happened, silver outperformed gold. However, we must really not get into this chart as the main reason to invest in silver, because this ratio can be as high as it is for a while. Because the silver market is much much smaller than gold, we can expect much higher volatility in it as this has been the case in the past. That said we have limited downside because silver has industrial and commercial demand, perhaps even growing demand as more electricity going forward will be generated by photovoltaics. We have seen the cost curve so we have a good idea what the bottom price is. Then there is the upside. The global economy is facing many crises, so it makes sense that silver will be looked at as a hedge against loose monetary policies much like gold, this metal could really see an uptick in price. Sure, buying and holding silver carries some costs as it is more expensive to store at a mint than gold, holding physical metals in the hedged part of your portfolio for whatever can happen in the economy in the future. Before I go, I would like to mention silver mining stocks. 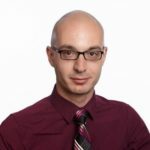 Although I am not as versed with Silver Stocks as I am with Gold Stocks, there are a few common rules you should consider before adding these equities to your portfolio. These are mining costs, the life of the mine, the company’s debt levels, jurisdiction, what development phase the mine is in, are just a few key things to consider before investing in a silver mining stock. But if you are ready to add physical silver to your portfolio, head over to GoldMoney right now to take a look at your options. The opinions expressed in this article are for general informational purposes only and are not intended to provide specific advice or recommendations for any individual or on any specific security or investment product. You understand that the author is not a financial advisor and does recommend you consult with a financial professional before making any financial decisions. The author has been holding physical silver since 2015 and does have a GoldMoney account for about the same time.